Aqueduct provides easy access to a range of interactive report dashboards. Program Service Administrators, Curriculum Administrators, Course Administrators, and Course Managers can all access reports on courses, cases, and student performance. Reports can be viewed online in the interactive dashboard, or downloaded and exported to a CSV file. Case partially completed = yellow circle showing the percentage of the case that is complete. Note, the percentage does NOT represent a grade or score! 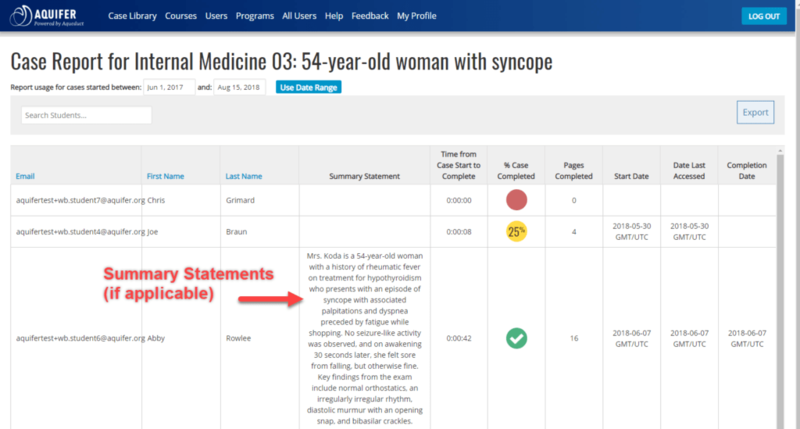 View student Case Summary statements next to the Expert Comment summary statement for easy evaluation. Sort: You can also click the column headers in reports to Sort report results by student email, first name, or last name. View student case resets to see if a student has reset the case, if this information is important for your program. Export a CSV File: All reports can be exported to a CSV file, which will allow you to sort and manipulate the data as you wish. The export button is located on the right-hand side of all reports pages. Students must answer all three required feedback questions at the end of each case—and click the Finish Case button in the Case Summary Download section—in order for the case to appear as complete on reporting. 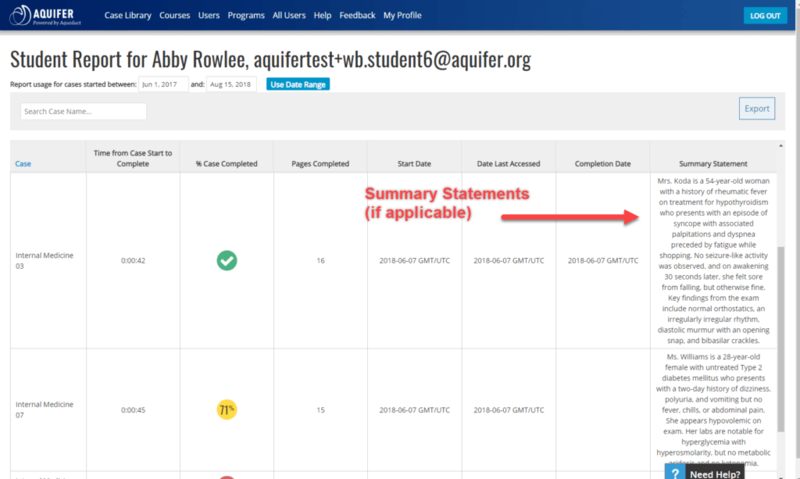 If students have worked through the case content but haven’t completed the feedback questions or clicked Finish Case, their work will show as partially completed—a yellow circle showing the percentage complete—on all Aquifer reports. Aquifer Signature Course Reporting: Reports for Aquifer courses that come standard with your subscription include student progress in the course for every student that is registered in the system. (Note: These reports can get large if your program has registered a lot of students and may include students who have not been assigned to work in the course. We recommend creating custom courses to access tailored reporting). Custom Course Reporting: Creating a custom course is a recommended step for programs that wish to access reports tailored to a specific set of students and/or cases. Custom course reports include results for only the students and cases assigned to the course. Optimizing your reports is just one of the many reasons to create a custom course—learn more. The Course Report provides a quick view of students’ progress through each case in a course. Choose Courses from the main menu. Click on the Course Report button on the right side of the screen. Email Address, First Name, Last Name for each student. 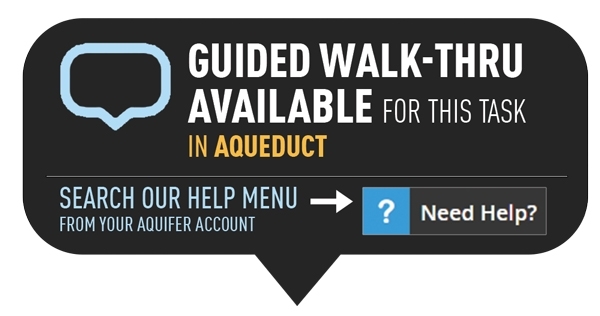 For standard Aquifer Courses every student who has registered in the system will appear. For custom courses, only students that have been assigned to that course will appear, regardless of whether they have registered in Aqueduct. Students who have not yet registered in Aqueduct will appear as ‘Unknown Unknown’. Total number of cases completed by each student. Progress through each case in the course shown in individual columns, as shown as a green circle for cases that have been completed, a yellow circle for cases in progress with the percent of the case completed, and a red circle for cases that have not yet been started. Cases that have been reset by the student will show with a black outline around any color circle. Hover over the blue icon next to the Case name and number to see the full name of the Case. The Case Report shows the progress that all students have made within a specific case within a course. From the Course Report: In the header row, click on the case number you need to access. Note: This calculation was updated in Nov 2018 to improve accuracy. Case Summary statement (if applicable). If the student is asked to write a summary statement as part of the case you will be able to view his/her submission here. The Summary Statement column will be blank if the student has not written a summary statement and will show N/A if there is no summary statement question within the case. Expert Comment summary statement (if applicable) for easy evaluation of your students’ work. Note: Scroll to the right to view this column. Note: The number of times the case was reset by each student will show in the Case and Student Report exports only. The Student Report shows the detailed progress of an individual student in each case in a course in just one easy step. From the Course Report page: Click on the email address of the student who you wish to track. Case Summary statement (if applicable). If the student is asked to write a summary statement as part of the case you will be able to view his/her submission here. The summary statement column will be blank if the students have not written a summary statement anything and will show N/A if there is no summary statement question page within the case. Note: The number of times the student reset each case will show in the Student and Case Report exports only.